Bookbub Recommends Nora Roberts Land! Nora Roberts Land, the first book in Ava’s bestselling Dare Valley Series, was recommended by Bookbub in their “18 Books to Read Instead of Watching the Super Bowl” feature on February 4, 2016. 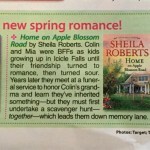 Nora Roberts Land Featured in Woman’s World Magazine! Ava’s #1 Bestseller, Nora Roberts Land, was featured in the February 15, 2016 issue of Woman’s World Magazine!